Besides returning to her day job, Sumie reacted by exploring other worlds: “I would go to the library and ﬁnd books about art, birds, history and poetry, and go to the cinema as much as I could. A safe way of escapism.” Yet this escapist route was no mere retreat: it opened paths of inspiration when she found a Swedish poem by Daniel Klevheden, ‘Divine Wind’, which she translated into English and made into a song. Nocturnal partings also underpin the Leonard Cohen-ish ‘Blue Lines’, where Sumie’s voice rings out sweet and pure over a plucked guitar. The soulful ‘Pouring Down’ finds her singing of “cold rivers” over warm keys, while ‘Frö’ (“seed”) occupies a world unto itself, existing in a state of suspended rapture. ‘Leave Me’ luxuriates over warm violins, recalling separations under “skies in black”. The mood is impeccably sustained for the gorgeously lilting ‘The Only Lady’, a riff on US-indie filmmaker Miranda July’s novel The First Bad Man, with quotes from David Bowie’s sweetly loved-up ‘Kooks’ included. To close, ‘Walk Away’ offers a final reverie on departures, its aching trumpet and plucked guitar building to the gentlest of crescendos. Those who helped Sumie climb that poised peak included producer Filip Leyman, in whose Gothenburg studio the album was recorded. Fellow contributors numbered Karl Vento and Albert af Ekenstam on electric guitars, Emma Strååt and Kajsa Persson on strings, and Max Lindahl on trumpet. Lately, Sumie has also surfaced on others’ work. 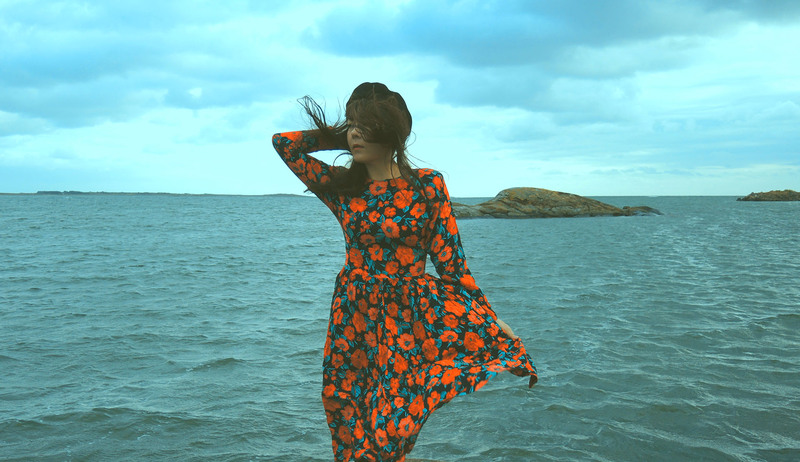 She sings on ‘Cover Hearts’, a track from sometime soundtrack composer David Wenngren’s Library Tapes project, and on Gothenburg electro-collective Tegami’s pulsing ‘Screen Dream’. Meanwhile, back at base camp, Lost in Light is a screen-style dream of an album itself: immersive while it lasts, haunting after it flickers out of view.